Club Sandwich may not be originally from Nigeria but Club Sandwiches are eaten a lot in Nigeria. 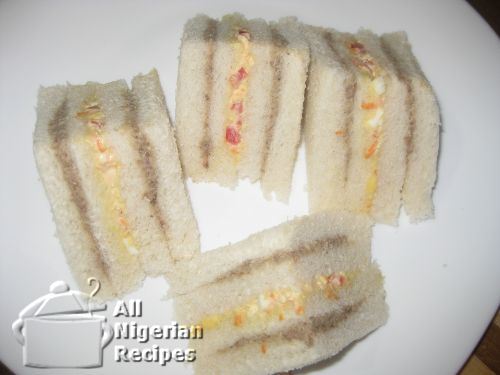 We have taken this recipe from the West and completely made it our own, so much so that we now have Naija style Club Sandwiches. Club Sandwiches are normally served on local Nigerian flights and exclusive hotels but you don't have to be mile-high to taste this snack or breakfast recipe. It is so easy to make so you should make one for yourself right after reading this. 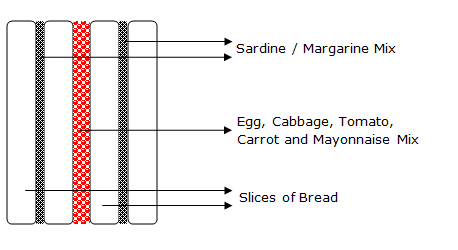 The following are the quantities of ingredients you need to make a Club Sandwich for one person. Feel free to multiply the ingredients. Wash all the vegetables very well. Scrape the carrot and remove the seeds from the tomato. Grate the carrot and cabbage using the small holes of a grater (see video below). Cut the tomato into very tiny pieces. Cut the hardboiled egg into tiny pieces. Add the mayonnaise to the carrot, tomato, egg and cabbage. Mix well and set aside. In a separate plate, mash the sardine with a fork and mix with the margarine. Don't worry if you don't like the smell of sardines, the margarine helps reduce the strong smell. Using a bread knife, cut off the crusty ends from the slices of bread. 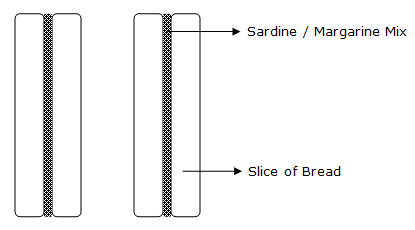 Take one slice of bread, spread the margarine and sardine mix on one side of it and cover with the second slice of bread. Now, take the first 2 slices, rub the carrot, cabbage, tomato, egg and mayonnaise mix on one side of it and cover with the other two slices. Cut the sandwich into desired shapes and sizes. Watch the video below to see how I cut mine 🙂 Serve the Club Sandwich with a hot chocolate drink or any chilled refreshing drink. Yummy!